The Church of the Immaculate Heart of Mary is a neo-classical Roman Catholic Church on Brompton Road in South Kensington. 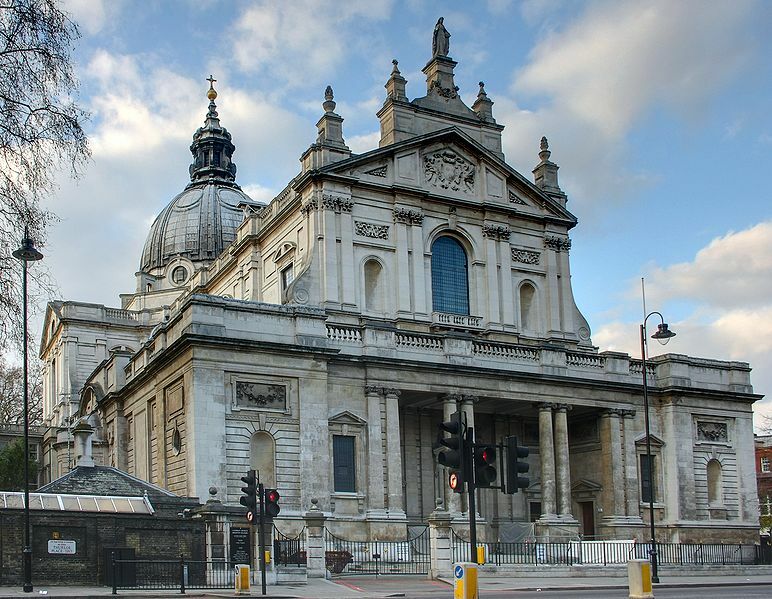 For this reason, and the fact the church was founded by Oratorians, it is known as the Brompton Oratory. Deliberately Italianite, you could be forgiven for mistaken the Oratory with the Chiesa Nuova in Rome until you look closer and see the facade is carved of Portland stone not travertine. The present church was constructed in 1880-4 to a design by Herbert Gribble. The interior is a treasure-trove of coloured marbles and important copies of artworks found in Italian Cathedrals. The eastern tower forms the Baptistery. The font is a half-scale reproduction of the one in Orvieto's Duomo. The basin is African Breccia marble supported by a stem of Derbyshire alabaster on a base of Carrara marble with eight white lions. The figure surmounting it is a reproduction of an angel by Donatello in the church of San Giovanni in Siena. The walls of this chapel are made of Irish marble. The altar itself is Neapolitan (much added to by H.Gribble). The central picture is of St. Patrick with St. Columba and St. Bridgid on either side - all by Pietro Pezzati - a 19th century Florentine artist. Attributed to the Flemish painter Frans Floris (1517-70) are the two paintings on either side of the altar. On the left is the 'Circumcision of Our Lord' (now a copy since the original was stolen from the church in 1983) and, on the right, is 'Our Lord in the arms of St. Simeon'. The small picture of the Assumption on the Tabernacle door was painted on copper by a Spanish priest in 1715. Snakes and shamrocks adorn the communion rails. The snakes remind us that St. Patrick banished all snakes from Ireland while the shamrock alludes to his preaching the Trinity. This consists of a white marble Pieta, resting on a bronze sarcophagus. Above are the arms of Great Britain surrounded by military insignia in burnished bronze. Four white marble tablet scrolls record the names of 250 Catholic servicemen who died in World War I. Designed by H. Gribble, the altar is of Devonshire marble, with columns of Derbyshire alabaster. The altarpiece of St. Mary Magdalene is by Codina Langlin. The mosaic panels on either side of the altar by A. Capello of Chelsea, 1883-4. The floor is Languedoc, Paonazzo and Siena marbles. The statues in the niches are of St. Teresa of Avila (left) and St. Camillus of Lellis (right), founder of the Servants of the Sick. They are reproductions of those in St. Peter's in Rome. The Relics of St. Eutropius, brought here from the catacombs in Rome, lie in a sarcophagus beneath this altar. The two confessionals are the most striking examples in the church: they are modelled on those in Antwerp, where much excellent Renaissance work was executed during the Spanish occupation of the Low Countries. The 'keys' and the 'sponge with the slate' in the hands of the angels, symbolize the power of the Sacrament of Penance both to forgive and wipe away sins. In 2010, following the beatification of Blessed John Henry (Cardinal) Newman a new altar and reredos was installed underneath the Organ Gallery designed by the architect Russell Taylor. The sculptures of Christ on the Cross, the Blessed Virgin Mary and St. John the Evangelist, are the work of Spanish sculptor Dario Fernandez of Seville. The background scene of Jerusalem is by the muralist, Alan Dodd. These were installed in 2012. Two panels at the ends of the altar bear the inscription: "This altar was erected by the Confraternity to the Great and Good God, and to the Virgin of the Rosary, in the year 1693" (left); "It was consecrated by Francis Corbarelli and his sons Dominic and Anthony" (right). Designed by Thomas Ruer, it originally stood in the Dominican church in Brescia, North Italy. The great altarpiece is 21ft wide and 40ft high and is composed of the finest Italian marbles with inlays of lapis lazuli, rock crystal, agate, mother of pearl, amethyst and red cornelian. The prophets Elias and Jeremias repose on the superstructure. The statue of Our Lady of Victories dates back to the original London Oratory in King William Street. On her left is a statue of St. Rose of Lima, the Flower of the New World and the first canonized saint of South America. On the right is St. Pius V, St Philip's contemporary and friend. Both these statues are by Orazio Marinali. The rest of the figure sculpture, including the statues of St. Dominic and St. Catherineof Siena, now moved from the altar to niches in the side walls of the chapel, are by T. Ruer. The four bronze candelabra at the communion-rails are copies from those by the altar of St. Ignatius in the church of the Gesu in Rome. This chapel was built in memory of Fath er Faber whose body is laid in a vault in front of St Wilfrid's altar. Originally the altar was the central portion of the High Altar of "Goote Kerke", the ancient Cathedral of St. Servatius, Maestricht, and was constructed about 1700. Above the door to the Sacristy on the left, is a painting of the death of St. Bede; opposite, above the confessional, a painting of the martrydom of St. Thomas Becket. To the right is the altar and picture of Our Lady of Good Counsel, a copy of the miraculous picture at her shrine of Genazzano near Rome. Opposite is the shrine of St. Cecilia with a replica in Carrara marble of Stefano Maderno's figure in the church of Santa Cecilia in Trastevere, Rome. The large painting above the shrine is a copy of Raphael's picture of St. Cecila and her companion martyr's, now in Bologna. Nearer the door are two altars erected in 1938. The one on the left is dedicated to St Therese of Lisieux and has a marble bas-relief of the saint by Arthur Pollen. On the right is the altar to the English Martyrs. The paintings on the altar are by Rex Whistler and were his only religious work. Sadly the originals were stolen in 1983 and are replaced by photgraphic copies. Above the main door to the chapel is a painting by Graham Rust in memory of Father Michael Napier, for many years Superior of this Oratory. 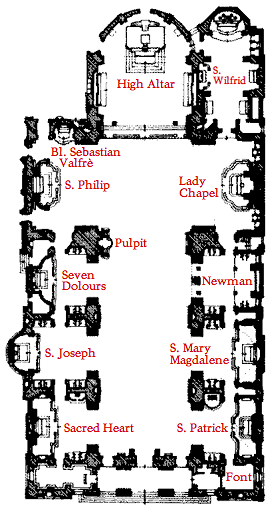 The Sanctuary floor is composed of inlaid woods – cinnamon, tofip, pear, mahogany, walnut and oak. The altapiece, a copy of one by Conca in the Turin Oratory, represents St. Philip blessing the students of the English College in Rome with the greeting, "Salvete Flores Martyrum" (Hail, Flowers of Martyrs) before they went off to martyrdom. The picture on the right represents the Capuchin's Vision of St. Philip conducting his disciples to Paradise. All three were painted by Pozzi between 1924 and 1926. Above the altar is a gilt heart surrounded by the rays which represnt the Immaculate Heart of Mary. The twin seven-branched sanctuary lamps (or Menorah) designed by William Burges and presented by the 3rd Marquess of Bute in 1879, were copied from the Arch of Titus in Rome, which shows the sanctuary lamps from the Temple being carried through Rome after the sacking of Jerusalem in 70AD. They are placed here to remind us of the fulfilment of the Old Testament by the New; the Sacrifice of the Mass being the perfection of the Temple Worship. The Canopy over the high altar was copied from the Basilica of St. Anthony of Padua. The altar is of Languedoc and Siena marbles with twisted columns and a pediment of black marble. The picture is of Blessed Sebastian Valfre, 1629-1710, who was co-founder of the Oratory in Turin. He was the very first Oratorian to be beatified. Designed by H.Gribble and composed of Italian marbles, this altar is dedicated to the Founder of the Oratory. The altar was paid for by the Duke of Norfolk at that time and so bears his arms. The altarpiece is a very good 19th century copy of the portrait of the saint by Guido Reni. Within the pediment in high relief is "The Death of St. Philip". Underneath the mensa, often hidden by the frontal, is a wax figure of the saint clad in vestments and containing a relic of his body. The scroll he holds bears the names of those killed during the Second World War. The altarpiece by Codina Langlin shows the Mater Dolorosa of Mother of Sorrows with the seven swords piercing her heart (each sword represents one of the seven sorrows of Our Lady: The Prophecy of Simeon, The Flight into Egypt, The Loss of Jesus in the Temple, Mary meets Jesus Carrying the Cross, the Crucifixion, Mary Recieves the Dead Body of Her Son, The Burial of Her Son and The Closing of the Tomb. The lunette above is filled with a copy of Francia's "Entombment", now in the National Gallery. This chapel is often used for small funerals. The altar was designed by J.J. Scoles, architect of the Oratory House. In 2005, due to the generosity of an anonymous benefactor, the architects Carden & Godfrey clothed the apse in red marble and added a Doric screen of six Sienna marble columns curving around and behind the altar, with two 17th century Italian Baroque marble angels surmounting it – originally part of the Lady altar. The 19th century statue of St. Joseph, Patron and Protector of the Universal Church and every Christians home, in white marble, is by a Belgian artist. The altar is a replica of that in the chapel of the Scuola di San Giovanni, Venice. The central niche contains a beautiful statue in Carrara marble of the Sacred Heart and on either side are angels holding the Crown of Thorns and the Lance of the Passion. Nearby stands a life size stone statue of this popular saint. On the right, under the Choir gallery, is an enthroned statue of St. Peter, an exact copy of that in St. Peter's in Rome. The Carrara statues of the twelve Apostles were carved in the late 17th century by Mazzuoli, a pupil of Bernini, and stood for two hundred years in the Duomo in Siena. The Stations of the Cross are in high relief, whilst the twelve recumbent figures over the arches of the Nave represent the principal virtues. Central groups of cherubs carry the Coat of Arms of Popes connected with the Congregation of the Oratory. Decorating the frieze of the main cornice is a Latin inscription in gold relief letters which says: "I have chosen and have sanctified this place that my name may be there and my heart may remain there perpetually: I have loved, O Lord, the beauty of thy house, and the place where they glory dwelleth". Mosaic panels flank the windows of the nave, which contain figures of saints, contemporaries of St. Philip. On the arches ceiling, large panels in mosaic and gold backgrounds, represent angels carrying emplems of the Passion of our Lord. The four spandrels under the dome are decorated with figures in mosaic representing the four Evangelists and around the frieze of the drum of the dome runs a gold inscription: the beginning of the Gloria. The large pulpit, typical of Oratorian Churches, was completed in the 1930s by C.T.G. Formelli. Completed in 1954 by J.W. Walker & Sons, it replaces that destroyed by fire in 1950. It was built to the specifications of the organist, Ralph Downes. The dome was erected in 1896, from the designs by G. Sherrin. Its framework is steel, faced with sixty tons of lead. Apart from this, the whole church was designed by H. Gribble. A statue of Our Blessed Lady crowns the Oratory facade.